The Messier Catalogue was developed in the 1700s by Charles Messier (1730–1817). Messier was a comet hunter working with speculum metal reflectors and small refractors that were the equivalent of a modern 80–100 mm reflector. As a result of the limited tools that he had to work with, he could not see the true nature of many of his "faint fuzzies" that are revealed in today's modern instruments. The RASC Messier Catalogue observing program has been awarded since 1981, and was the first RASC observing program with certificate). If Messier were alive today, he would no doubt be astonished at the size, distance, and complexity of the various objects that he catalogued. As a comet hunter, they were often nuisances, since they "got in the way" of his search for new comets. Open Clusters 28 Includes many beautiful open clusters like M6, M7, The Beehive, The Pleiades, and The Wild Duck. Globular Clusters 29 Includes the showpieces M13, M22, M5, and M3. Bright Nebulae 8 Includes the great Orion Nebula as well as the Lagoon, Swan, Eagle, and Trifid Nebulae. Planetary Nebulae 4 Includes the impressive Ring Nebula as well as the Dumbbell and Owl planetary nebulae. Galaxies 40 Includes the amazing Andromeda Galaxy as well as M51, M33, M81/M82, and many others. Double Stars 1 This is M40, an unusual Messier object. The RASC Messier Certificate has been awarded since 1981. A certificate and pin are awarded to RASC members who visually observe all 110 objects on the Messier list as published annually in the Observer's Handbook. Note that there are several published versions of the Messier list, so it is important to follow this official reference. There are two versions of the Messier Certificate: Traditional (star-hopping) and Computer-aided (GoTo). Observing the Messier Catalogue is an excellent observing project, as it contains many showpiece objects. Moreover it allows you to see the Universe from an 18th-century perspective and to learn more about the night sky. The RASC Observing Committee has created special observing forms to help you complete the Messier Catalogue observing program. These Messier Catalogue observing forms (653 KB, 110 pg) will help to keep your observations in one organized file. The forms feature all of the important data about each Messier object and a generous area for making notes and drawings. The objects may be onbserved in any order. Application forms can be found from a link at the bottom of this page. The Messier Objects - by Stephen James O'Meara is a definitive guide to the Messier catalogue. 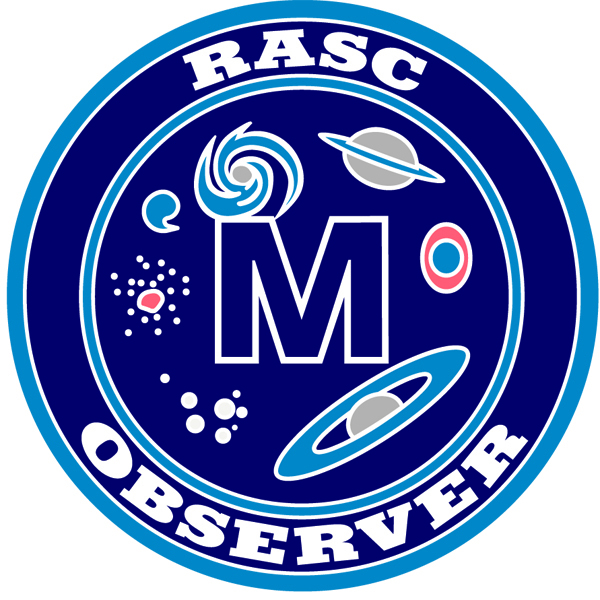 Find out details about RASC's Messier Catalogue certificate here.